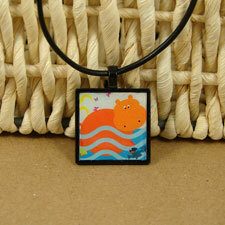 Our exclusive happy swimming hippo image has been magically transformed into a pendant! Black metal square pendant comes with an 18" black leather adjustable cord. Not water proof - please remove for swimming or bathing.